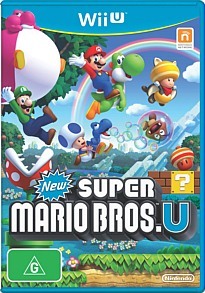 New Super Mario Bros U Wii U In the end New Super Mario Bros U is an extremely fun game on the Wii U which proves classics can still make it in a world of games such as Assassin's Creed and Call of Duty. Five words sums up New Super Mario Bros U.... "Launch day", "Full HD" and "Awesome". Playing New Super Mario Bros U is a true gaming moment on the new Wii U console that is fun fun fun! 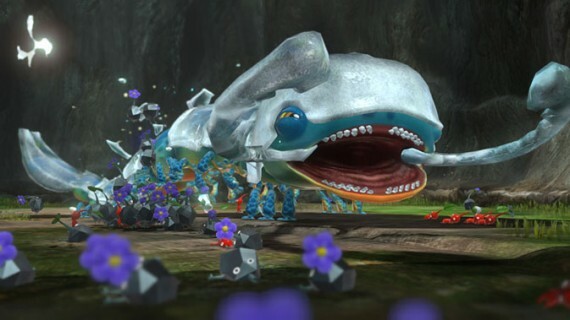 Not only does it feature amazing FULL HD crystal sharp graphics but it offers some very entertaining gameplay thanks to the new Wii Gamepad controller and the best multiplayer experience ever in this franchise. Experience Mario together like never before with Miiverse. See other players' comments and accomplishments while you play and leave your own feedback for others to see when connected to the Nintendo Network. Even though the majority of gameplay has been seen before, the improvements made to this game on the Wii U still make it one of the best launch games of the console. At its core, New Super Mario Bros U is a classic slide scrolling arcade game that requires gamers to get from point A to B as they solve a variety of puzzles and fight their way through a never ending hoard of enemies. In terms of story, Nintendo continue with the new mythology of this franchise as Mario and co must rescue Princess Peach from the dastardly Bowser AGAIN! As soon as the game boots up, the world of New Super Mario Bros U is oozing with Nintendo goodness that starts in the Acorn Plains and then moves into a variety of colourful gaming worlds from haunted houses to jungles and deserts and lots more. Best of all, each world has various elements on how to complete them with multiple exits, ensuring greater replay value and longer gameplay. On the Wii, the Gamepad controller definitely creates an interesting yet fun gaming experience which can either be played on this device or the big screen. This is a great little feature if someone else wants to watch TV or if you want to watch TV and continue your gaming session at the same time. For multiplayer, you can hook up your old Wii controls for up to four players. 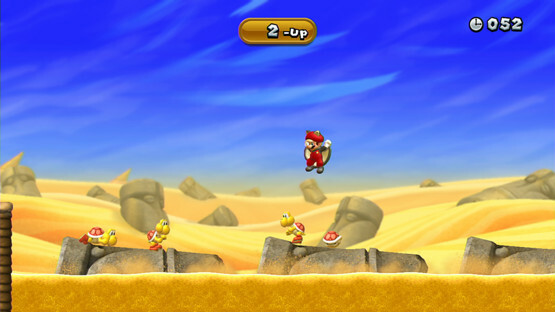 The four playable characters include Mario, his brother Luigi and two Toads. Another interesting feature is that if you have four Wii controls, the fifth person can then use the Gamepad to interact with the gaming environment such as creating platforms or obstacles. It definitely makes for some interesting gaming chaos. The only setback of multiplayer is that it is local play only. However the game is linked to the Miiverse which allows players to leave little notes in the gaming world that can be shared. Strange! As you navigate the world in either solo or cooperative play, there are plenty of points and power-ups to collect such as turning enemies into coins or Mario becoming a flying squirrel or getting your baby Yoshis to eat your enemies. These bonuses definitely help spice up the action but when you're playing with others, it becomes a mad dash to these power-ups. All in all, the gameplay works flawless for single and multiplayer. 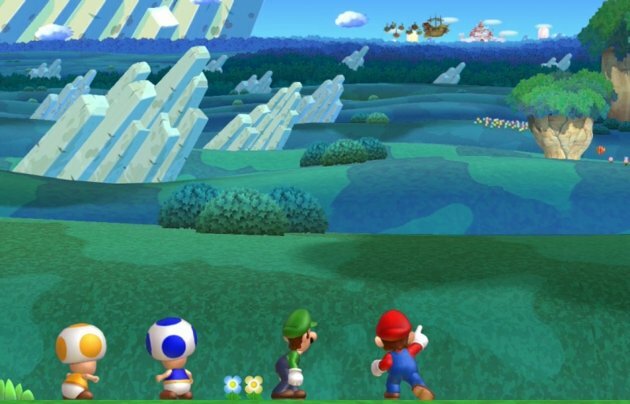 Graphically, New Super Mario Bros U looks crystal clear on the Wii U, thanks to the high definition graphics. It's easily the best looking Mario game created and although it's a 2D side scroller, Nintendo have ensured that there are plenty of special effects to make the game look like a next-gen title... to an extent anyway. The soundtrack is classic Mario as are the sound effects. In the end New Super Mario Bros U is an extremely fun game on the Wii U which proves classics can still make it in a world of games such as Assassin's Creed and Call of Duty. The visuals look amazing, the gameplay, although quite retro is pure Mario which makes this a must have title for the console.